Nothing says Mexico like mariachis! 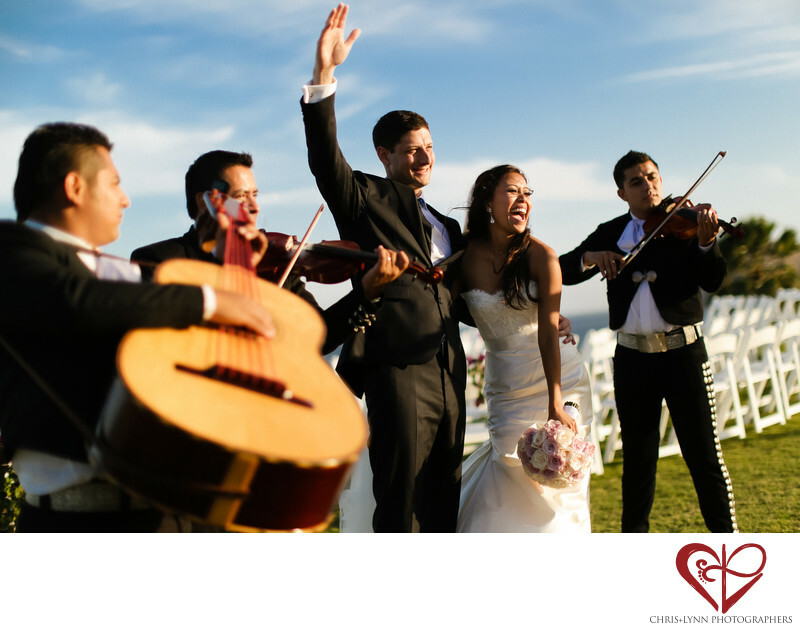 The traditional accompaniment to all important moments in Mexican life, their music adds en element of culture and fun to the wedding day! Their music always expresses powerful emotion and encourages audience participation - either with dancing or with shouts of "Olé!" Mariachis are a popular choice in Los Cabos for destination weddings as they create such an air of festivity and celebration! They are also very versatile, playing lively music to encourage dancing or more tender music as a romantic serenade during the processional for example.The most common option is having them play right after the ceremony to lead the bride and groom, wedding party, and guests to the party! This image, photographed immediately after the recessional captures the joy of the couple at being married! The musicians playing heightens their feelings of happiness and soon afterwards, everyone was dancing! Cabo del Sol is one of Los Cabos' most perfect wedding ceremony & reception venues. The Cabo del Sol clubhouse offers large his & hers getting ready suites for the bride and groom, as well as numerous shaded arcades perfect for bridal portraits, groom portraits, family portraits, and wedding party portraits. The beachfront ceremony site above the Sea of Cortes is one of the most iconic wedding locations in all of Los Cabos. This wedding was designed and planned by Karla Casillas of Karla Casillas & Co. Florals & decor were provided by The Main Event Cabo. 1/8000; f/1.2; ISO 100; 50.0 mm.